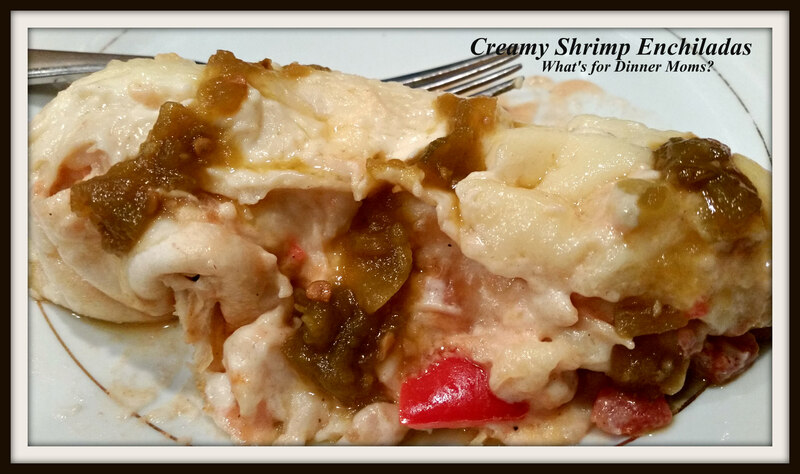 Karami Salsas and Creamy Shrimp Enchiladas – What's for Dinner Moms? 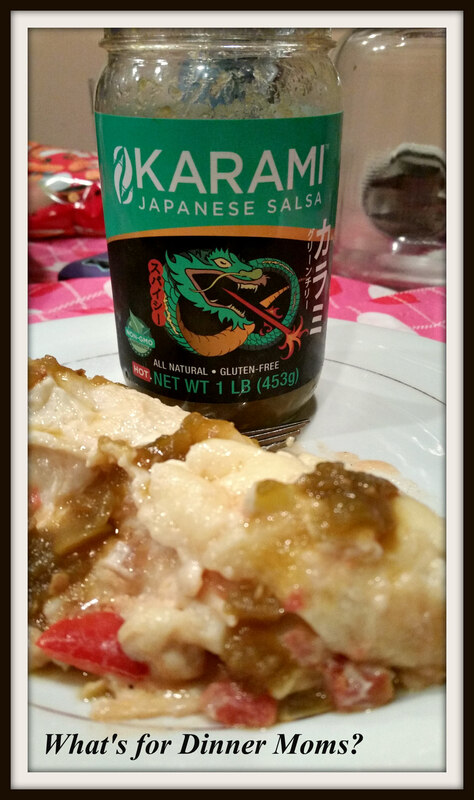 Karami Salsa* sent me two jars of their Japanese salsa to try. I went on their website Karamisalsa.com (click for link to website) to find out more about the company and the product. The first thing I liked was the ingredient list: roasted green chili, organic teppei blue agave, organic gluten-free tamari, garlic, citric acid. That is it! The history of the recipe is VERY interesting. Finding that green chili peppers have the same consistency as seaweed and would work in creating Japanese dishes? I never heard of anything like that before. I was a bit concerned as the only heat is hot for their salsa. There is no mild flavor. But, I put a bowl of tortilla chips on the table and poured some in a bowl for the whole family to try. Now, my daughter who has a very low heat tolerance thought it was hot but the sweetness (yes, there is a good hit of sweetness before the heat hits) helped. She ate more than the one chip I thought she would eat. At one point she said the flavor kind of reminded her of Sweet Chili Nacho chips with more heat. My son happily dug in. He loves the heat and thought it was perfect. My partner said she loved the flavor but would like the heat tempered a bit so we started coming up with ways to cut the heat. Mix it with a bit of cream cheese for a dip or serve it with rice or potatoes to temper the heat. I began to plan dinner and at the last-minute realized I could use this salsa over the top of our shrimp enchiladas. Some days you just want something creamy and comforting. These shrimp enchiladas are a great way to fill the cravings. These were packed full and very creamy. Adding the heat and sweet over the top with the Karami Salsa made it a whole new dish. These were very filling and the entire family left the table stuffed. I wasn’t sure how the shrimp in the enchiladas would go over as my family is generally not a fan of seafood in Mexican food but there were no complaints! I served this with a green salad to complete the meal. Preheat oven to 350 degrees. Spray a large 13 x 9 casserole dish with non-stick spray. In a large skillet over medium heat add olive oil, onions, and peppers to pan. Saute’ until onions are softened. Add garlic to pan and cook for 1-2 minutes until garlic is very fragrant. Remove pan from heat. Stir in tomatoes, shrimp, chilies, chili powder, Cayenne, salt, and pepper. In a second pan melt butter over medium heat. Once butter is fully melted sprinkle flour over top of butter and stir to make a paste. Allow to cook for 1-2 minutes until it starts to lightly brown in color. Slowly add cream to mixture. Stir continuously to avoid lumps. Allow mixture to cook 3-5 minutes until it thickens. Add 1 1/4 cups of the cheese to the mixture and stir well. Remove 1/4 – 1/2 cup of the cheese mixture and stir it into the shrimp mixture. Taste mixture and adjust spices to your liking. Fill tortillas with shrimp mixture placing seam side down. They will be packed in tightly! (I had a bit of extra filling that I put over rice for lunch the next day). Once pan is full pour the cheese sauce over the top of the tortillas and sprinkle with remaining 3/4 cup of cheese. Bake for 25-30 minutes until mixture is heated through in center. Top should be beginning to brown. If you would like you can put it under the broiler for 1-2 minutes to brown cheese. Remove pan from oven and serve with Karami salsa over the top if desired. *I am in no way affiliated with the Karami Salsa company. I received two complimentary bottles of salsa to try with no conditions. All thoughts and opinions are my own and should be read and interpreted as such. Love chilli with seafood so this should suite me perfectly. Oh, no! No seafood or just shrimp? That would be difficult for me. I love seafood. But, I suppose illness or death wins over seafood. Nom nom, I love shrimp enchiladas! I’m sure this was awesome, and totally neat that you got sent some from them to try out. Thank you! It was very nice of them.